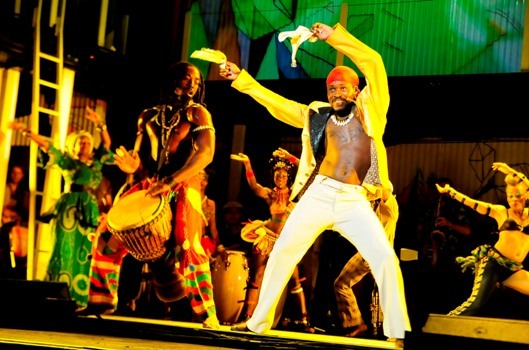 Editor’s note: The musical “Fela!” opened on Broadway in late 2009 and closed in January 2011. The original production is now on tour, with some cast changes. In November, 2011, San Francisco critic Suzanne Weiss reviewed the production with Sahr Ngaujah in the title role; below, Los Angeles critic Karen Weinstein reviews the production with Adesola Osakalumi in the part. In your mind is there a difference between a theater piece and a show? And does it matter? Your answer to those two questions may predict your reaction to the Ahmanson’s current offering, “Fela.” When I go to the theater, I look for dramatic quality. Is there an arc? Does it move me? Do I care about what happens to whom? What I look for in a “show” is simply entertainment. A show can be a spectacle or a display. Admittedly, this attitude has the ring of elitism. Guilty as charged; I may as well be honest. Working from those, admittedly personal, definitions, “FELA!” is a “show” replete with the contemporary definition of attitude. Fela Anikulapo-Kuti created his own mix of music, Afro beat. Up front, Fela (Adesola Osakalumi) lets the audience know he left Nigeria to study medicine in London, just like his two brothers. On the way he became infected with everything from Frank Sinatra and James Brown to the Cuban beat. Fela was no African village boy. His mother was prominent as the country’s leading feminist. His father was an Anglican priest. Fela burst on the musical and political scenes with the special hubris available to an attractive son of prestige. This would-be doctor instead found an adoring international music audience and phalanxes of followers at home. There is no curtain to be raised. You are at Fela Kuti’s nightclub called The Shrine; it is in a skuzzy and dangerous part of Lagos. Musicians straggle on stage one by one. Little by little the driving beat begins to unfold and wildly costumed booties drift on to the stage and shake at an unimaginable pace. If you ever wondered about the meaning of “shake your booty,” wonder no more. The dancers who have wandered on stage along with the musicians make it abundantly clear. The music is raw, and Marina Draghici’s set and costumes capture the colorful unpolished style of an African club. Lights finally dim and Fela, wearing a slick 1969 jump suit, microphone in hand, takes charge. He is the MC; this is his story, his club, and his music. Ostensibly this is a concert in tribute to his mother who died in a military raid on Fela’s compound. More to the point, it is a tribute to Fela himself wrapped in a self-serving reverence for his mother, a visible super-ego. The relationship is not totally convincing. Fela’s music has the driving rhythm of traditional African music; it is mixed with the Western influences he acquired abroad. The stage throbs with the beat and the dancers are in constant motion. The first 15 or 20 minutes are hypnotic and almost no audience member resists when Fela orders them to stand up and learn to dance. By the end of the two and a half hours the repetitious music and the perpetual booty shaking become more tiresome. Bill T. Jones is a marvelous choreographer, but while these are skilled Broadway dancers, they are not the caliber of his regular troupe, nor is his choreography the level he creates for his own company. His direction, however, is the same high quality he brings to all his works. Words and fragments are projected onto parts of the set and the colorful, but a bit tacky, look captures the style of a non-touristic, African entertainment spot almost thrusting out into the audience. Fela’s music (albeit deafening at some points) is the core and the strength of the show. Fela conveyed political messages in his lyrics, garnering him support and adoration. His general tone is “power to the people.” While there are projected news stories of Nigerian suffering, Fela’s own political ideology was vague and superficial; this was true in reality as well as on stage. Quite the stud, and hardly the reverential son of a feminist, he married 27 women in one ceremony, and 12 in another. That is in addition to an earlier wife who bore him three children. In the end “Fela!” is disappointing as a theater piece. It is a show, plain and simple. The references to Fela’s mother, and the ballads sung by her spirit, seem pasted on. The arc is but a gangplank to his music, which might best be experienced on its own. Would you buy an album— make that a boxed set—of Fela’s music? If so “Fela” will not disappoint. If a couple cuts are all that would interest you, better pass this one up.